Micro controlled based electronic Paddle Level Switch. Housing : Aluminium, weatherproof , powder coated. Integral with the probe Cable Entry : 2 nos. Mains Voltage : universal 65 to 260 V AC , 50 Hz /24 V DC Output : 2 sets of potential free c/o contacts rated at 5 amps, 230 V AC for non- inductive loads. 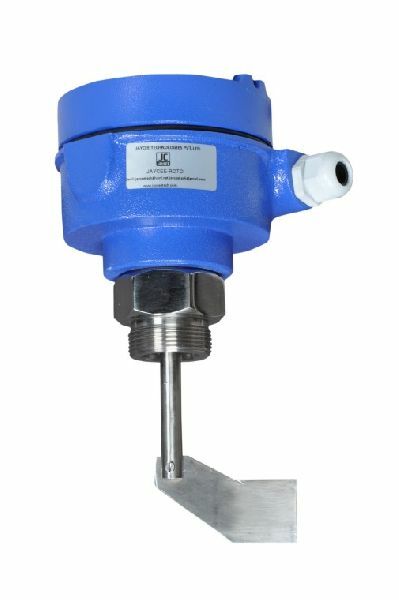 Insertion length : 150 mm standard, Ambient temperature : Power Consumption : 8.1 VA Fail safe : Selectable for High or Low Mounting :Screwed BSP ( standard) Or Flanged (Optional) Sense rod : Stainless steel, 12mm DI Paddle : 1-4 , paddles depending upon application. Operating Temp. In : 80 for the standard units. 200 beet slice, hard crop Chemical industry : Plastic powders, granules, pellets Food industry : Oil seed, food grains Indusry : sand, calcium powder, gypsum, cofee and cocoa powder, flour, sugar, etc. Energetics: soot, coal powder, fly ash. Salient Features: No cluch, no gear , no spring. Flexible coupling (optional as per application). Robust, dust and watetight housing. Extended probe possible. Extended life by motor shut off design Sealed bearing. Interchangeable paddle assembles. Torque adjustable low, medium & high as per medium. Fail safe switch selectable. 2 relay output each 1 SPDT. Building industry materials, cement, sand,lime, etc. Foodstuff industry , milk powder, flour, salf, food grains, etc. Plastics industry, powder,granular,fruit slice etc. Timber industry, chemical and mining. Freight : Extra by courier on topay basis. Payment : 100% against proforma invoice.